And so it was that I Photograph to Remember first appeared as a tale Pedro narrated softly and tenderly as he showed close friends a box of photographic prints. Encouraged by their response and his own recent acquaintance with digital photography and especially by Bob Stein’s vision of new media, Pedro, working as well with his son Manuel Rocha, who composed the music, transferred this live presentation to the CD-ROM, a media which was just beginning to have an impact on the computer world. This CR-ROM became a new multimedia benchmark: it was one of the first examples of wedding image and sound. It became the first commercial CD-ROM with continuous audio and images. Later in the 90s as the MacroMind Director Player format of this early CD became increasingly unreadable by later operating systems, it was reengineered in Shockwave and placed on Pedro’s ZoneZero web site. Then late in the summer of 2006, sixteen years after its inception, Pedro made I Photograph to Remember available so it could be downloaded to a video iPod. With this new iPod appearance the presentation of I Photograph to Remember comes full circle, returning to the intimate, personal presentation I first encountered listening to Pedro telling the story of his parents as we looked at photographs at his kitchen table. For the video iPod is the new delicate, miniature locket, the new talisman and family heirloom of the information age. It is the new treasured daguerreotype or tintype case worn around the neck or tucked into a breast pocket through whose glass and ear buds we experience these fragile, poignant memories with the immediacy of Pedro’s first personal presentation. More than this, snapshots and family portraits in particular are not only instantly posthumous but are also instantly suspended in the anonymity of time and space. Without written text or narration their link back to the heft and identity of the physical world will certainly be lost. Most snapshots like untended headstones in overgrown or ancient graveyards slowly lose their connection to history and their status as worldly evidence. Their subject is no longer readable, recognizable or known: they decay and disappear without a trace. I Photograph to Remember can be understood as a project to arrest this inevitable decay. It is neither a pure documentary project, nor is it in truth, as the title suggests, a project to make photographs as an aid to memory. Rather it is a storytelling undertaking, constructed with the aid of the photograph, that engages on the level of a parable in order to recuperate and revitalize a set of early snapshots and previously made photographs that were languishing, suspended; whose presence was slowly fading from reality and identity, hidden, as most photographs, in albums and storage boxes. The photographic strategy of I Photograph to Remember follows the classic, narrative, photojournalistic tradition seen in magazine spreads which reached their apotheosis in LIFE magazine’s photo essays. But with some important exceptions the images in I Photograph to Remember are far less inflected, more modest, and less self-conscious than Pedro’s earlier documentary work, such as the material gathered together in Espejo de Espinas (Mirror of Thorns). Looking back from the body of significant digital work that Pedro produced since I Photograph to Remember, the restrained simplicity of the images in this first digital project allowed them to conceptually bridge the analog world of Pedro’s previous straight photography and the world of digital photography that would follow. In the earlier work the formal compositional geometries of the decisive moment, compelling social commentary, subtle wit, and a hint of metaphor inform the most successful photographs. In the digital work which follows, these compositional devices and political and social commentary are introduced or inflected most frequently through digital rather than discovered means. 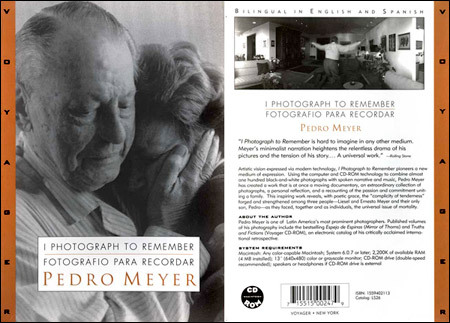 In I Photograph to Remember the photographs are sequenced chronologically following the timeline of Pedro’s parent’s illnesses and the logic of the narrative. After the stage is set with the initial twelve snapshot frames, the photographs progress from moments of genuine sentiment to images that record moments of loss, suffering, pain and death. In the early stages of his parents’ illnesses the photographs resemble innocent domestic snapshots faithfully recording family warmth, melancholy and the fear of illness. But as the essay progresses and his parents’ illnesses become more acute, Pedro generates more precise, taut compositions that juxtapose spatial elements, human correspondences, and human interactions. In these images such as the first view of his father being medicated (17:51), the close-up of his mother’s hands (21:20), her preparation for brain surgery (22:22), and his father in a darkened room with a white garbed attendant in the background (27:35) Pedro dispatches the full potential of black and white tonality to portray heightened emotion and misfortune and to introduce metaphors of anguish and consolation. In these images the tension between white hospital garments and the ever encroaching blackness leads us to the threshold between vitality and mortality. Finally, in the photographs of each parent wrapped in the white shroud of death (26:19 and 28:57) the quietly dramatic illumination transforms the corpse into an iconic representation which insistently and elegantly confronts the mystery and terror of death. Because Pedro produced these photographs concurrently with his experiments with digital image manipulations which would become Truths & Fictions, it is informative to look at the expressive, panoramic image of his father flying (9:41), which occurs early in the piece, in comparison to the later highly manipulated images, particularly the work from Oaxaca that makes up the second half of Truths & Fictions. In Truths & Fictions when Pedro wanted to signify flight, the transformation from earth to air would happen magically with the aid of Photoshop. Here in I Photograph to Remember his father remains earthbound. Kneeling on a chair, his arms outstretched not to the heavens but to the interior of his home’s elegant and expansive living room, his gesture of flying is anchored in the pain of reality and the human hope for relief rather than in the production of myth. Being part of the world rather than detached and manufactured in a new synthetic reality, the gesture becomes an exquisitely felt symbol; it is both the longing for and the impossibility of transcendence and redemption. The photographs in I Photograph to Remember also acquire meaning from the poetry and modulation of Pedro’s voice. In human society storytelling is probably older and arguably more fundamental than picture making. Oral stories were passed from generation to generation with the music of the voice, its inflection, rhythm and modulation becoming as much a part of the narrative as the tale itself. One has only to look as far as contemporary religious liturgy to see how this phenomena still operates in our own time. The visceral power of I Photograph to Remember derives from this oral tradition. In some respects I Photograph to Remember has less to do with photography and more to do with liturgy, poetry, and the expressive voice. Indeed it is possible to just listen to Pedro’s narrative to become mesmerized by the story. It is not necessary to experience the actual images: the narration is strong enough to conjure up mental images without ever seeing the photographs. The photographs, like the notes of a score, provide the pattern and structure, phrasing and timing, which are interpreted and brought to life through the haunting invocation of Pedro’s speech. I Photograph to Remember is essentially a performance monologue which holds our attention in great part because of the music of the speech and the universal truth of the story. It is rare that an early work of art in any media retains its power and durability through changes in technology and presentation. The enduring quality of I Photograph to Remember lies not in any single component of the piece: not the narration, the photographs, the music, nor the sequencing. Rather its genius lies in the synthesis of these elements through and in contrast to new technology. New media provides the vehicle for a seamless, cinematic integration of these components. Yet I Photograph to Remember in everyway except for its use of cinematic continuity, is built on the transparency and richness of the ancient oral tradition. In it Pedro is not Pedro Meyer, the critic, commentator and theorist of culture and new technology of ZoneZero, but rather the Baal Shem Tov, the teller of legends and miracles. I Photograph to Remember is not a digital production but rather a digital utterance. It utilizes none of the devices we have come to associate with new media, strategies that Pedro himself will use in his later digital work: digital compositing, sampling, remixing, interactivity. And while it now plays on the ubiquitous devices that define our digital age, it always surprises us that such complex instruments can achieve such directness and simplicity. When we plug in our video iPod we are astonished not by hyper remixed reality but by poetic grace. Is Director of the UCR/California Museum of Photography at the University of California, Riverside, and holds joint appointments as a professor in the departments of Studio Art and Art History. 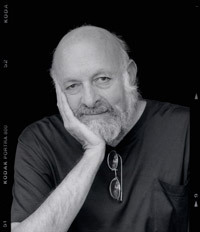 Green was associate editor of Aperture Quarterly, 1974-1976. His book American Photography: A Critical History, Abrams, (1984, reprinted 1996) was selected as the Nikon Book of the Year, 1984, and received the Benjamin Citation from the American Photographic Historical Society in recognition of achievement in photographic history. In 1993 Green curated Pedro Meyer’s exhibition Truths & Fictions and his commentary on Meyer’s photographs can be heard on the Voyager CD-ROM. Some of Green’s recent curatorial projects include One Ground: 4 Palestinian and 4 Israeli Filmmakers (2003) and, in collaboration with Trisha Ziff, Revolution and Commerce: The Legacy of Korda’s Portrait of Che Guevara (2005). Green’s photographs are in museum collections worldwide and have been published in American Images: New Work by 20 Contemporary Photographers, 1979. Green was awarded photography fellowships from the National Endowment for the Arts (1978) and AT&T Bell System (1979). Before coming to Riverside, Green taught at MIT and Ohio State University. At MIT he was co-founder of the Media Lab's Visible Language Workshop. At Ohio State University he was the Founding Director of the Wexner Center for the Arts. From 1999 through 2002 Green was a Fellow at the California Science Center where he curated Leslie Payne: Taking Flight. The system of instant Virginia Loans Online allows any adult U.S. citizen. Moreover, to order Cialis Daily online is highly advantageous because it interacts well with the small portions of alcohol and food.